The Lit Club begins an initiative aimed at improving Eiji’s bad-boy image with the rest of the school, though Nanako likes him the way he is, even when his eyes roll back in his head when he’s deep in thought! 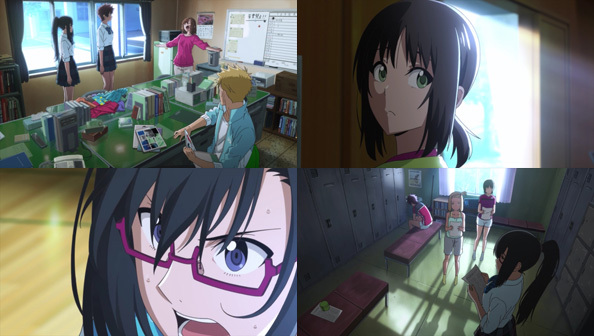 That’s when Eiji’s beautiful “big sis” Ootsuki Koto shows up to thank Nanako and Amane for taking care of him. 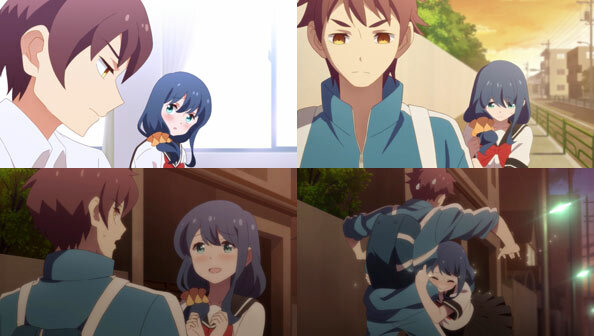 Turns out she’s just his childhood friend two years his senior. 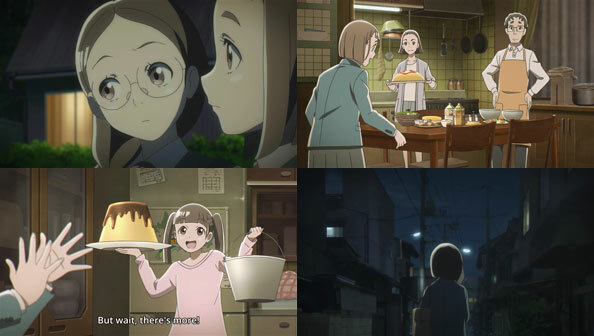 Then, while having a meal together, Eiji notes how much Nanako eats—not with malice, mind you—and Nanako starts to fear she’s gaining weight. 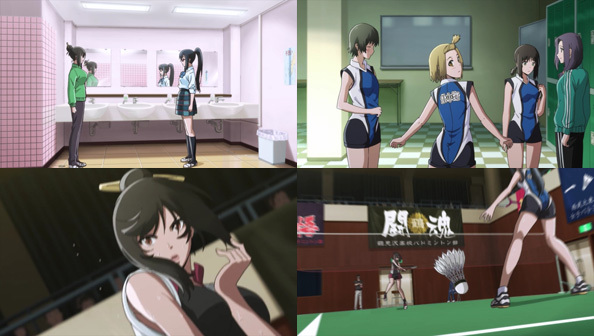 When her little brother teases her for eating as much as a sumo wrestler, Nanako resolves to go on a diet, but Koto offers to train her instead, using her military self-defense skills to whip her into shape. Time passes, and an excited Nanako takes Eiji’s hand and places it on her stomach…which would be quite forward if we didn’t know her true intentions were honorable. Instead, Eiji has to mention how he’s never felt a girl’s stomach and thus has no basis for comparison for Nanako to realize her faux pas. Still, one think Nanako shouldn’t be ashamed of is that she likes Eiji—a genuinely nice guy—just the way he is. If others get to know him, they’ll learn the same thing. Koto already knows this, but when Amane asks if she likes anyone (if she had to give her a name, it would be Eiji), she says she doesn’t; not the way Amane means, anyway. 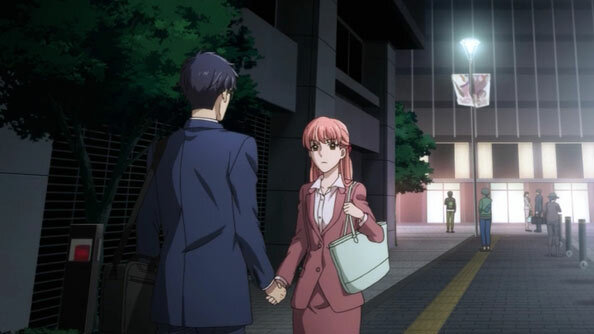 Koto is fine with her and Eiji just the way they are, even if it means him getting closer to Nanako. 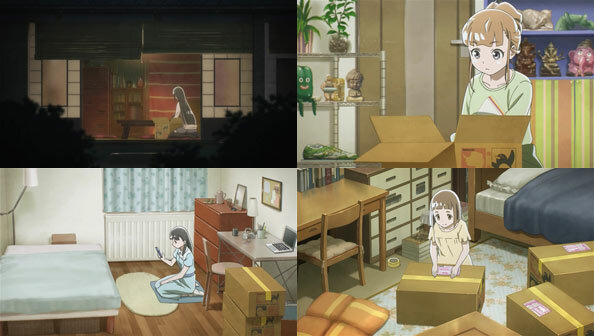 As it is, SS is a school slice-of-life with romantic undertones that just happens to integrate haiku wherever it can. And like that show about women enjoying various alcoholic beverages after work, it succeeds at its limited domain just as much as it needs to—which is to say, it’s fine. 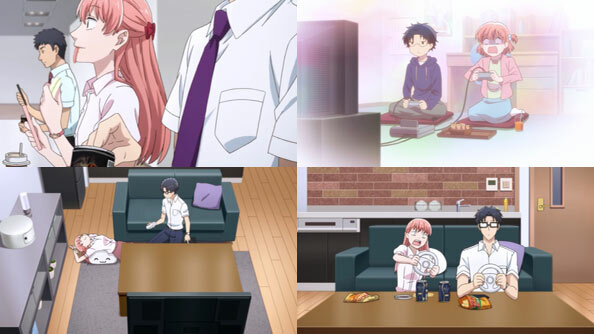 Where WotaKoi distinguishes itself from Working!! 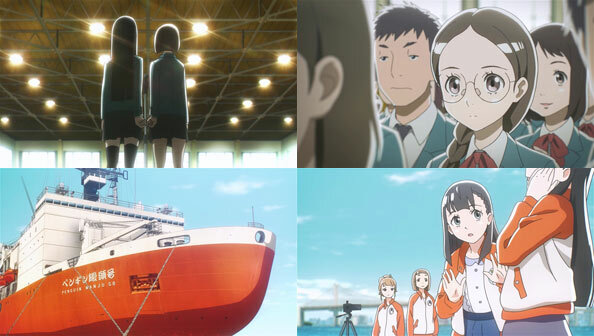 and its various sequels is the speed with which the main couple comes together. 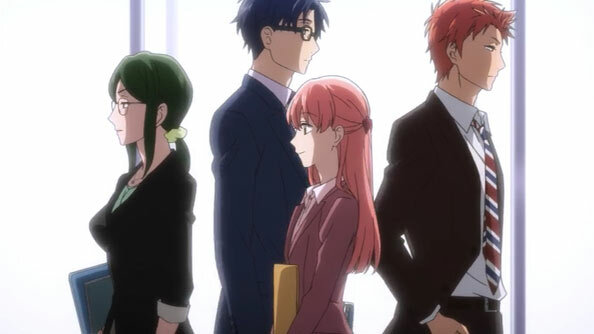 Even when Hirotaka and Narumi are a little awkward at work, their friends Koyanagi and Kabakura point out the positive aspects of the other party, and that they’ve made the right choice. 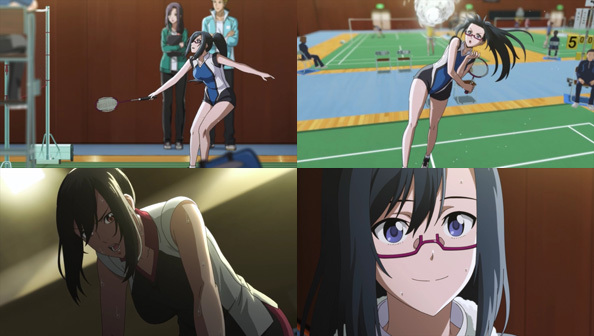 But when Narumi somewhat carelessly admits Kabakura might be more “her type” in earshot of her boyfriend, she draws his ire, and the episode takes on the structure of a multiple-choice RPG, in which her avenue of escape is blocked until Kabakura and Koyanagi—former captains of their schools’ volleyball teams—start going at it, and she exploits the opening to flee. 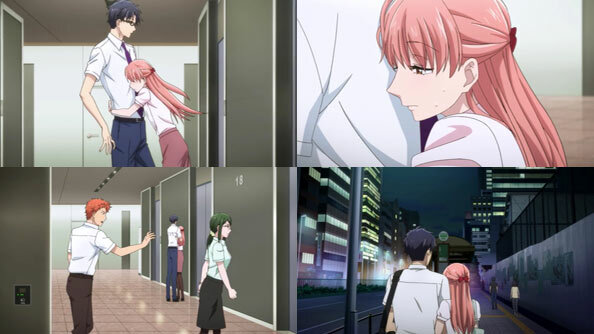 Hirotaka chases after her, however, which results in the two adults working things out right then and there. She was scared of his reaction, while he was worried she didn’t like him anymore and wonders if it was a bad idea to confess to her. In response to that, Narumi hugs him tightly, telling him not to say such things. She makes sure he knows she’s happy he confessed, and likes where they’re at. Some initial awkwardness is to be expected in a romance where the two parties work together. 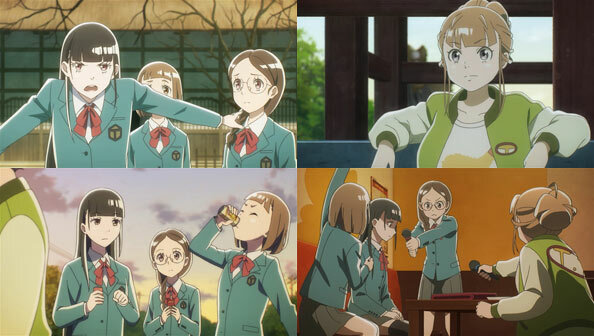 Those initial hiccups in the relationship are all but forgotten in the next segment, in which the quartet decides to go out for drinks after Narumi finishes up some OT work. 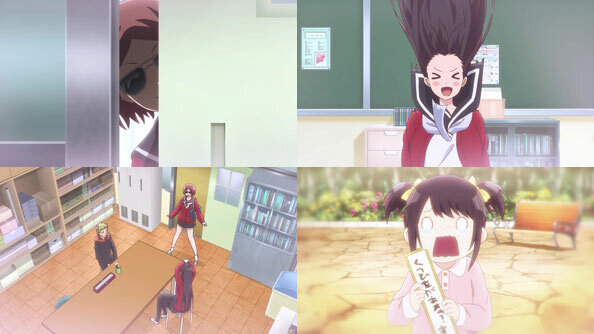 But because all four of them are otaku, they decide to head to a bookstore first. Once there, the women split from the men. 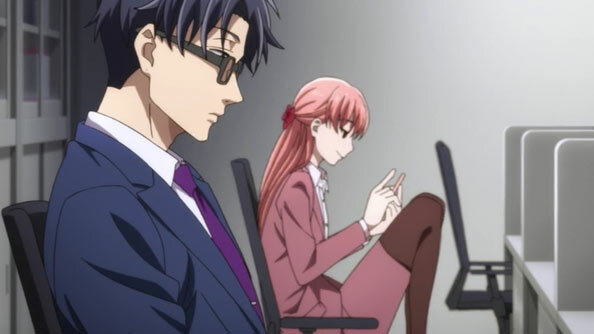 Narumi and Hirotaka may be dating, but their forms of otakuism differ, which means on occasion they’ll give each other a berth in which to pursue their individual interests. 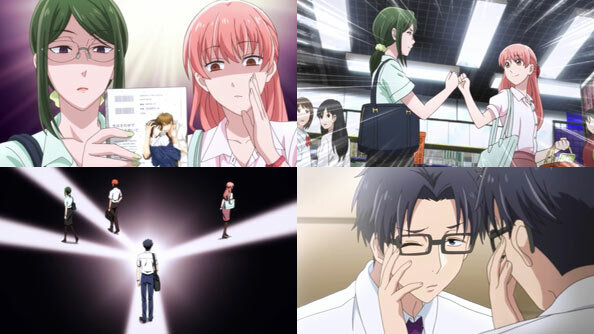 That’s especially the case on a night when Narumi gets to browse and shot with Koyanagi. 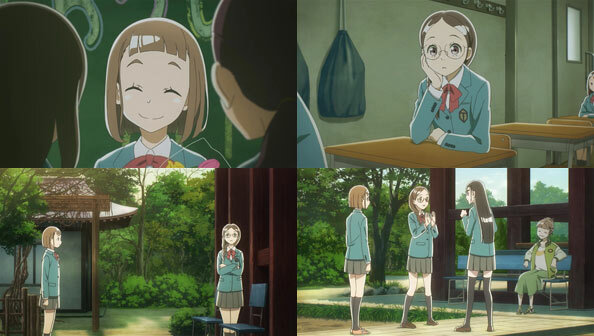 Narumi has always hidden her otakuism from her friends, and feels liberated for finally not having to. 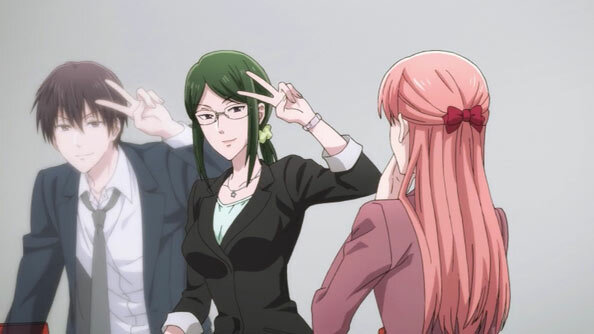 Koyanagi, for her part, wants Narumi as a cosplay partner. 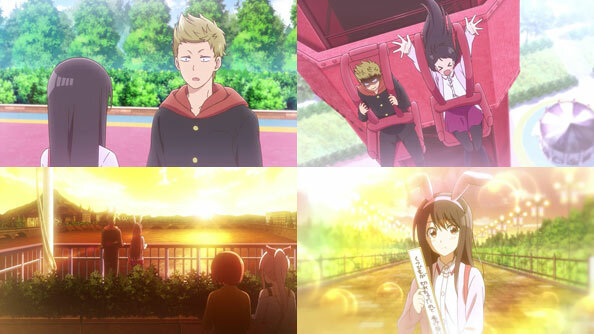 The result of the group’s extended shopping trip to the bookstore is that everyone other than Hiyotaka bought so much stuff and they’re so eager to read it, they skip going out for drinks altogether, part ways for the night, and stay up way too late. The next day they’re all groggy at work, which might actually work in Hiyotaka’s favor with regards to his attempts to learn how to wink! 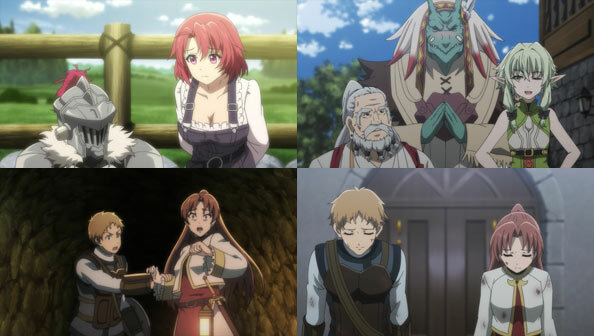 While I’m sure it will expand to more people before too long, this is a fun quartet of people so far, consisting of a definitely-together-yet-casual couple and a long-standing love-hate/will-they-won’t-they. 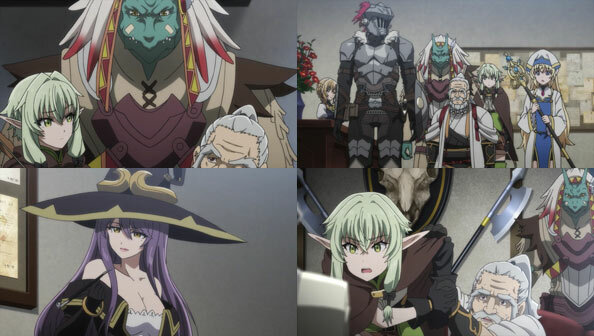 Those two kinds of dynamics on display lend balance to the proceedings, and the volume of jokes is high enough that even if some might not land huge laughs, there’s always more to come. From the director and series compositor of Working!! 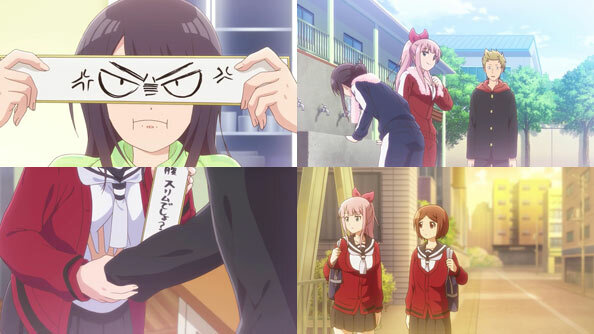 (and Momokuri) comes another workplace romantic comedy involving two otaku who knew each other in both elementary and middle school suddenly realizing they work at the same drab office. 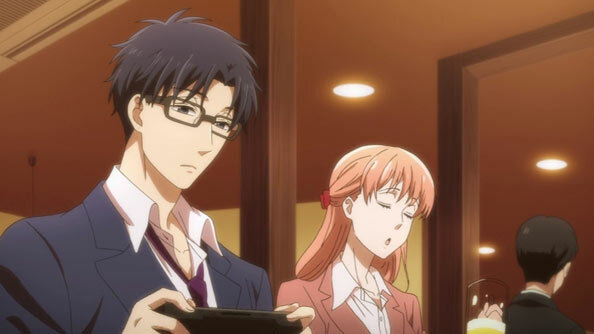 Momose Narumi is a fujoshi, while Nifuji Hirotaka is a game otaku. They fall back into their old dynamic almost immediately, as reflections of each other that don’t have to put on airs. Narumi also seems able to hold her liquor, while Hirotaka smokes like a goddamn chimney. 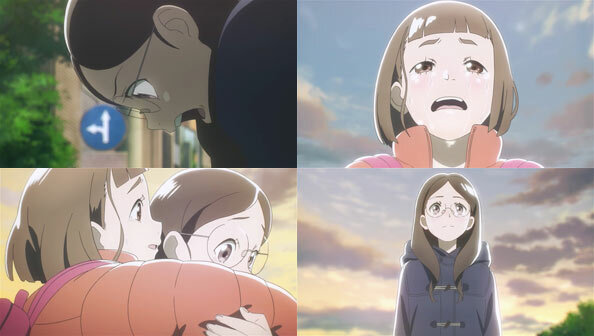 They may not be kids anymore, but they remain steadfast otaku, and seem to draw strength and validation from one another’s continued sustained to their mutual odd obsessions, even if, at least initially, Narumi has no intention of dating her childhood friend. 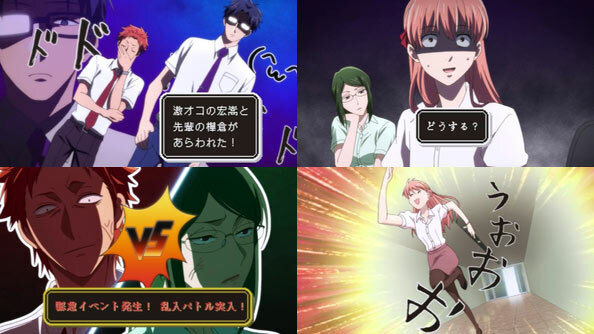 Narumi is a particularly lucky otaku salarywoman, because her office senpai Koyanagi just happens to be “in the fold”, having cosplayed as a man at many an event. 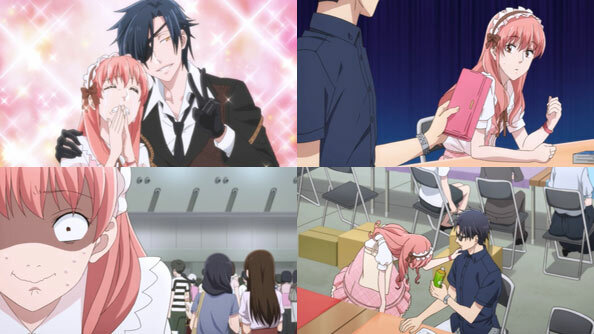 Koyanagi also happens to be a great fan of Narumi’s fujoshi work. Narumi took a risk by being open about who she is and what her interests ares, and it paid off Koyanagi is even cooler than she initially imagined. 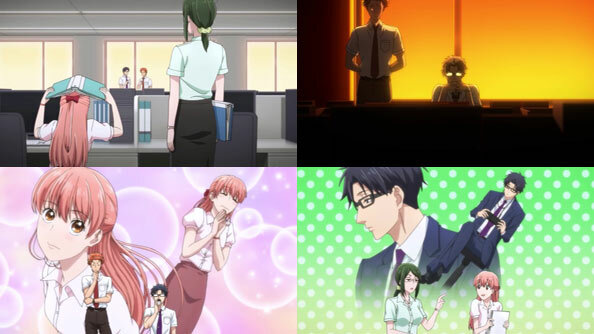 As for Hirotaka, he’s slightly better at his job than Narumi, but that may well be a factor of him being with the company longer. 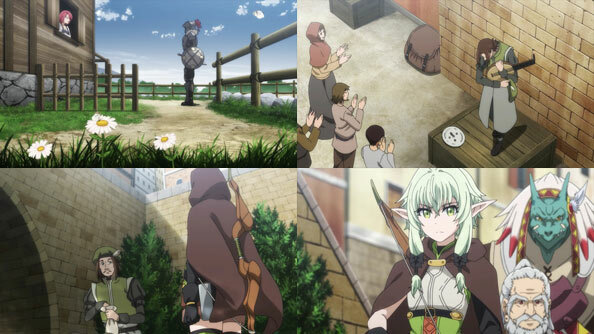 Narumi left her old company due in part to having dated and broken up with her old boyfriend who worked there once he found out she was an otaku. 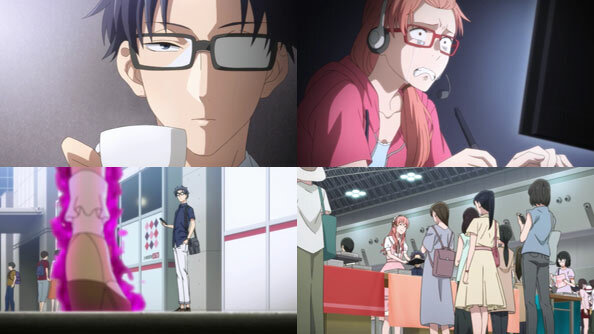 Hirotaka has no such qualms, as he is himself an unapologetic otaku, and is all too happy to wait for Narumi to finish her work so they can go out for drinks. It’s also Hirotaka who proposes Harumi should just date him. 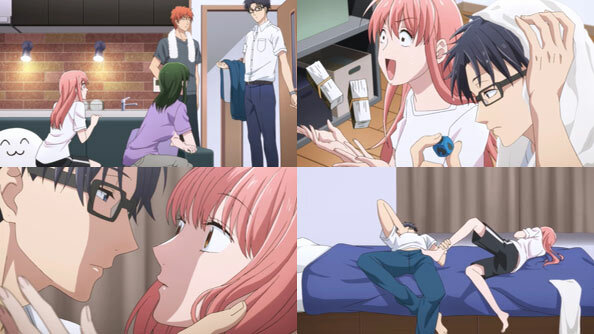 She herself voiced frustration over always “making the wrong choice” when it comes to love, so she’s willing to defer to Hirotaka in this case. He offers her a blindingly logical argument for why she should choose him: he will accept her for who she is, and she can do the same. 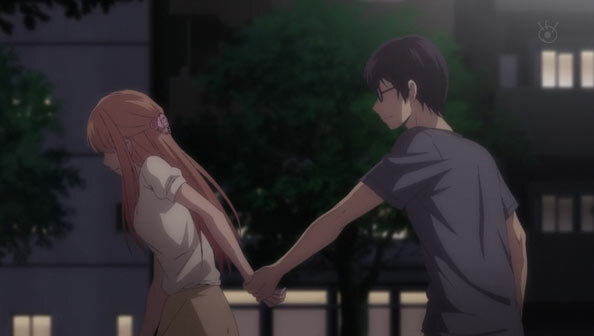 He can also accompany her to events like Summer Comiket. 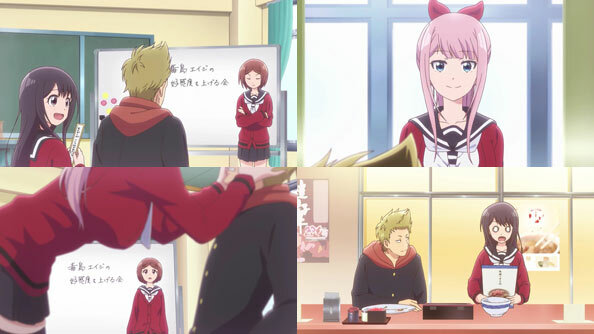 It’s a match made in otaku heaven, really. 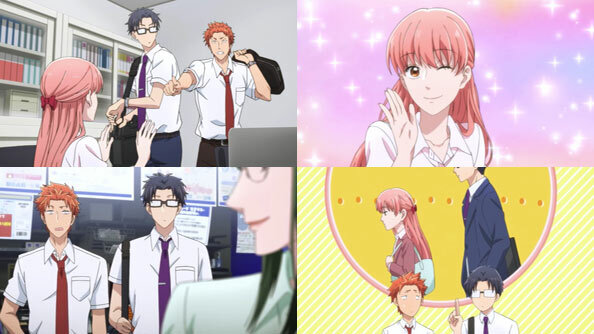 WotaKoi is a brisk and breezy little show that doesn’t waste a lot of time getting its main couple together. Their exchanges are easy, casual, and comfortable, and their pairing up feels both inspired, inevitable, and thoroughly reasonable. They sport a great effortless chemistry, and I’m eager to see how their new “alliance” works out. 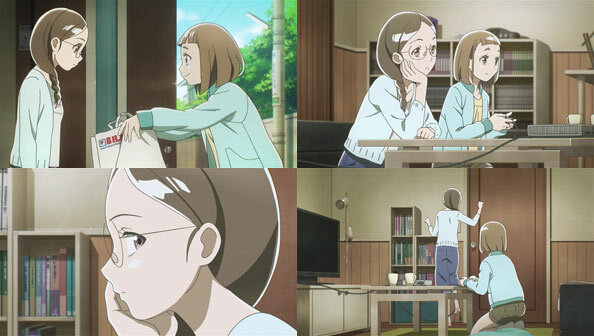 The thing is, Mugi does know Akane better than most, if far from as well as she knows herself. He knows from watching her all these years how she jumps from man to man. In her inner thoughts, she tells us how it was always like that since her first: taking all of a man’s love and giving nothing back; taking all the jealousy of the other women and wrapping herself in it. This is the process by which she assigns worth to herself, and it’s the only process she’s ever known. 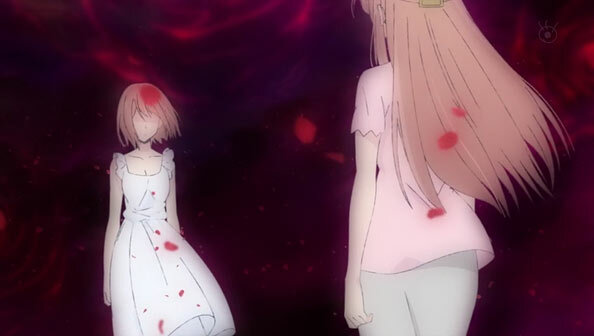 She executes the same process with Mugi, “shattering his world” so that she can keep standing. But unlike other men, Mugi knows her game, and wants to change the rules. But he also knows changing her is no mean feat, as she isn’t someone who’s ever fallen for anyone, only had others fall for her. 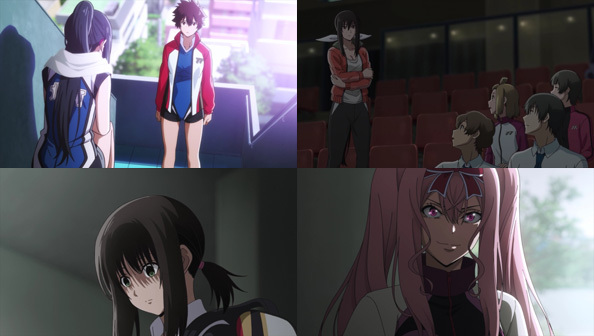 After scores of random, inconsequential men who simply played the game her way, Akane now finds herself afoul of not one but two very different men. 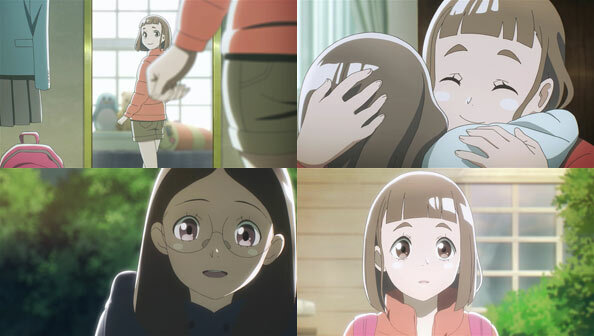 Even though Mugi knows what kind of person Akane is, and even when another man tells Kanai, neither of them flinch in their devotion to her. The difference is, Kanai doesn’t care, and wants her to be herself. Mugi, on the other hand, still wants to change her. During their aquarium date, Akane racked her brain about what exactly Kanai’s deal was. 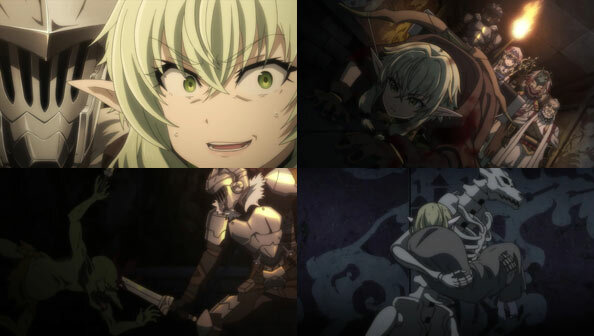 She felt like she was the one pursuing him by committing so much of her thoughts to him, and didn’t like how it felt, so tried to make the date their last. 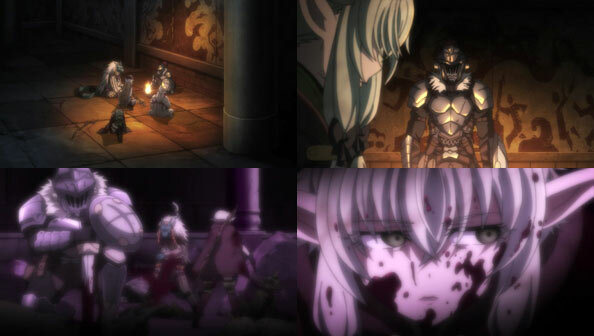 She thought if she told him enough about who she is (or at least the perception of that person that had been crafted both within and without), but Kanai still stopped her from leaving. 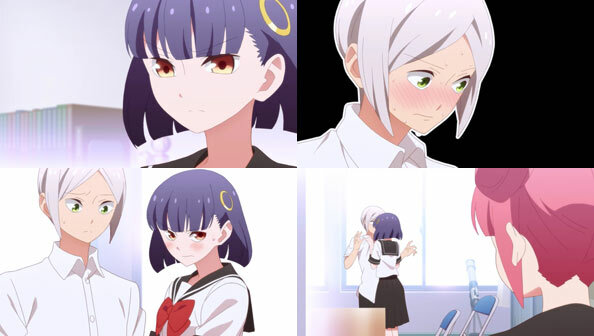 Akane has been unique in Kuzu no Honkai as the only character not “in love” with another. 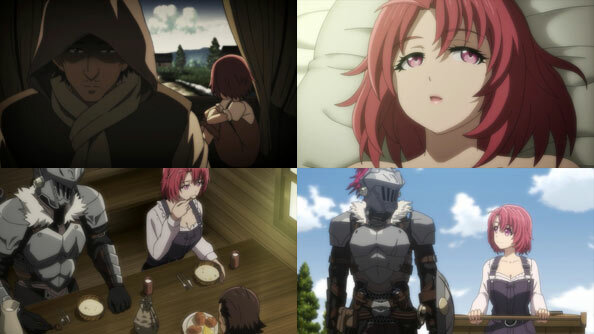 Indeed, Akane may not even know what it is to love someone. She’s been loved by men many times before, and every time she shattered their worlds and danced on the ashes. Now things are different. Neither Kanai nor Mugi will back down. Both know who and what she is, yet still yearn for something she’s never experienced: a relationship that endures, a prospect that doubtless terrifies all parties involved. 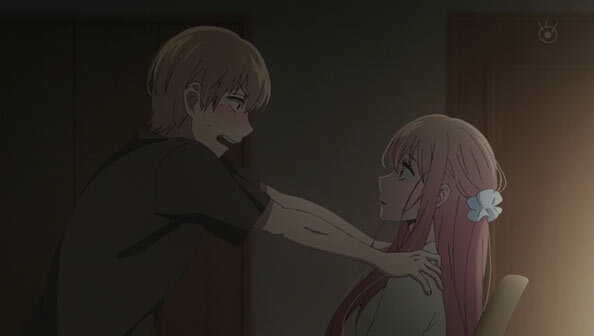 But Mugi knows the only way he can change someone else is by starting with himself. That’s advice he got from his pact-mate, Hanabi. 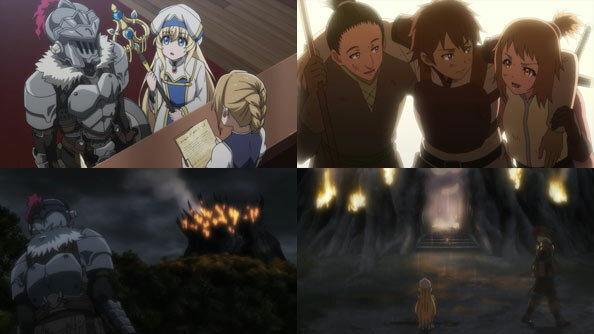 Can Mugi actually succeed, and if he does, where does that leave Kanai? 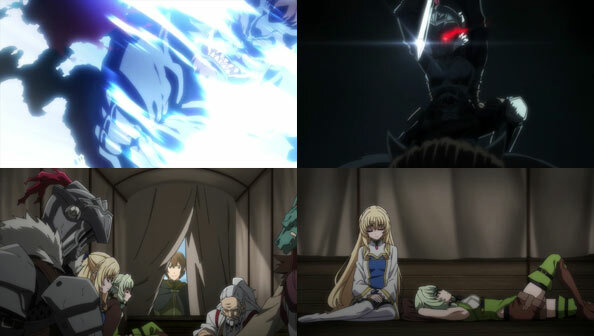 Hanabi, Ecchan, and Moca are in pretty good places emotionally right now, but it feels like Mugi’s still operating deep in that murky soup they once inhabited. 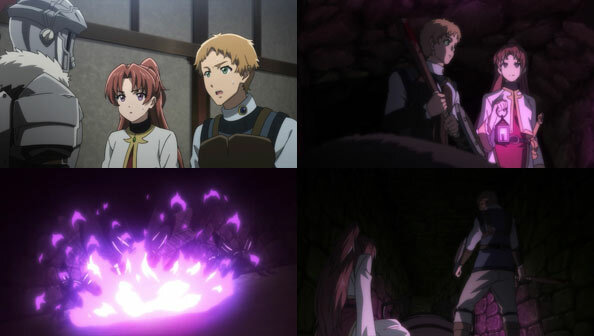 Who, if not himself or Akane, will be able to help him out?